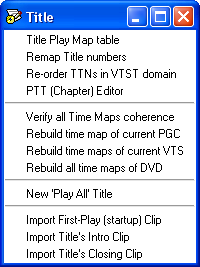 Title Play Map table: Displays the global table of the DVD Titles (VMG_TT_SRPT), and enables you to modify the Prohibited User Operations (PUOs) defined in this table as well as compute and modify the not one-sequential title flags for each title. Remap Title numbers: Use this function to renumber the titles in your DVD. References in VMG are automatically updated as are all references in the commands. For more information, see this guide. Re-order TTNs in VTST domain: Sometimes, you will want to remap the PGCs of a titles domain which contains several titles. In so doing, the TTNs (the internal title numbers of the VTS) will get out of sequence. Use this function to assign them back into order. References in VMG are automatically updated, as are all references in the commands. PTT (Chapter) Editor: This is a more advanced chapter editor than that which is accessible from the PGC Editor. With this editor, you can add or delete chapters, or modify them for both one-sequential and not one-sequential titles (titles that are spread over many PGCs and where the chapters may be “out of order”). Simply select a chapter (PTT) and move the PGC and Program (PG) sliders where you want them to be. You will not be able to enter a PGC that is not within the title or a non-existent PGN. 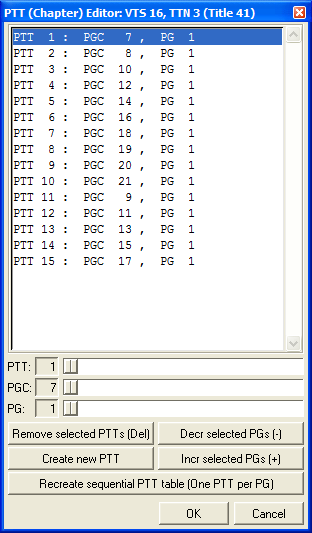 Pressing the Recreate sequential PTT table button will make a new chapter table for the title with one chapter per Program and in PGC sequence. PgcEdit will generally let you know if a time map needs rebuilding. This will usually be after you have added or deleted cells from a title using the PGC Editor. However, you can verify the time maps yourself and rebuild them manually for a PGC, VTS or the entire DVD. · Verify all Time Maps coherence: This function verifies that the number of entries in the time maps matches the correct times of the title PGCs. Note that it doesn't verify if the entries themselves are correct; to do that you need to rebuild the time maps. · Rebuild time map of current PGC/VTS/DVD: Allows you to rebuild the time map of the current PGC/VTS/full DVD. New ‘Play All’ Title: Creates a new PGC with all the VOB/Cell IDs of the current VTS. This PGC plays the entire video of the Titleset. This may be useful for a multi-episode DVD, which doesn’t have an option to play all the episodes as a whole. Only applicable to the titles domain. Import First-Play (startup) Clip, Import Title’s Intro Clip: These functions import a title from another DVD and modify the DVD’s commands to play the imported title at DVD startup, or before the selected title. These functions need an unused GPRM to operate and PgcEdit will advise you which GPRM to use. You can import a still and select how long it will be displayed (0-254 seconds) or an animated clip. Import Title’s Closing Clip: This function is similar to the above but can be displayed indefinitely. You can use this function to show, for example, an “Insert Disk 2” clip/still on projects you have split into 2 DVDs. After the clip is finished playing, you may end playback, return to the menu, restart the DVD or clone the behaviour of the original DVD. Usually cloning the original behaviour of the title is best.